Calming crisp air invites you in as you make your way into the one bedroom furnished apartment block. For the couple or the single person who prefers a more especial apartment, this option suits you in the best way. The sitting area oozes with an aura of classic warmth. The sitting arrangement provides a comforting intimate feeling with leather seats, a dining area with a table for four on the side. A flat screen TV stands on top of a shelf on one corner where you can display your favourite collections, souvenirs or books. The wall and ceiling lighting provide a bright and beautiful tone for the space while the wide windows diffuse light into the room capturing daylight in its natural form. There is also a private telephone line on the TV shelf. The kitchen area draws a warm delightful atmosphere as you walk in. 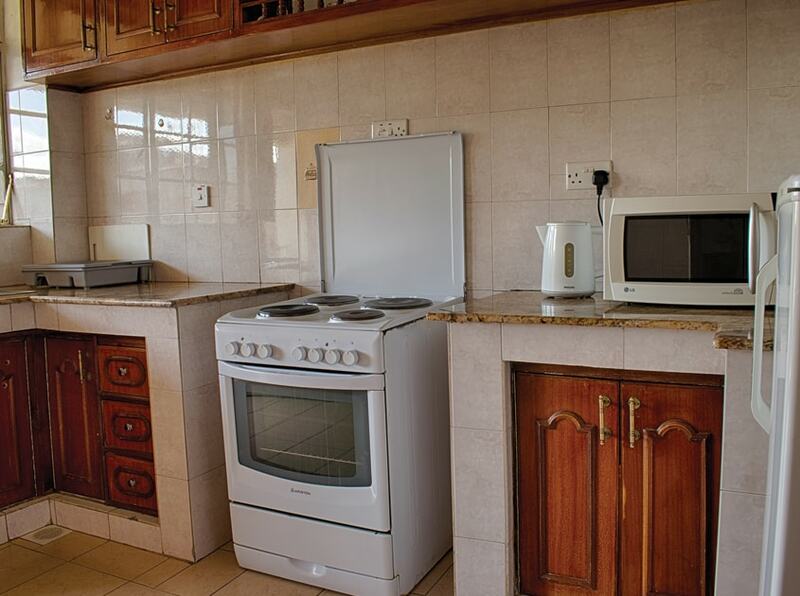 It is complete with modern essential appliances and has a standard setting similar to the other apartments. The marble counter tops and ceramic tiles make it easy to clean in case of any spillage. There are brown cabinets attached underneath the counter and sink creating a larger storage space for items you might need to put inside. There is also a cooker with four gas burners. the kitchen also has a built-in brown cabinet with shelves to store basic kitchen ingredients, an electric water heater, a fridge and a microwave. The bedroom has one double bed with enough room for two as well, a vanity table with drawers right below it, all attached to a built-in closet: the closet has two sides with sufficient space enough for two or even for a single guest carrying clothing for a longer stay, a bedside table stands next to the bed and two windows to let in great lighting creating an alluring mood. There is also an ironing board and iron box provided for the guests as well as a sleeping net. The bathroom has ample shower space with a shower curtain to create more privacy, a mirror with a sink right below it, a laundry basket next to it, waste bin, a wall-mounted towel hanger and a towel shelf. The bathroom is well-lit as there is a window that is halfway between the modern toilet area and shower section to bring in enough light to the room and avoid the boring idea or myth that one-bedroom apartments or houses have ‘dark bathrooms’. 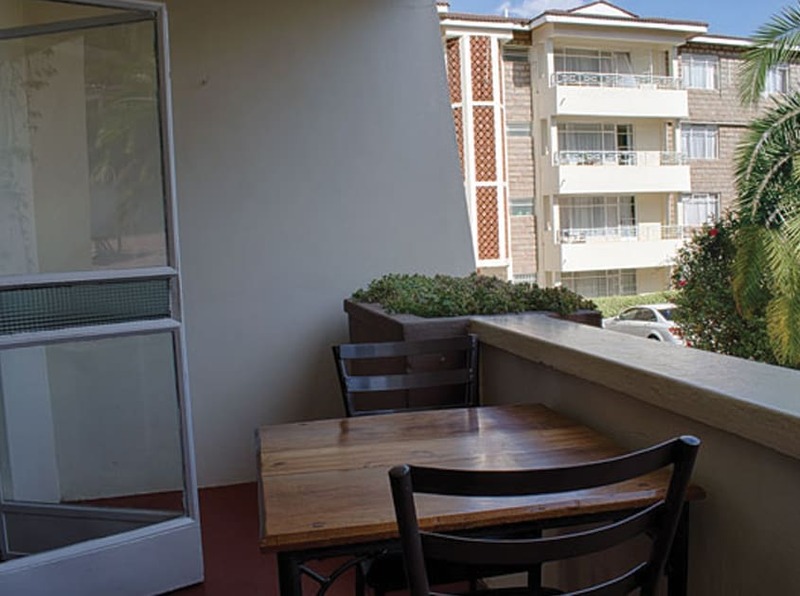 What’s a serviced apartment without an outdoor view? 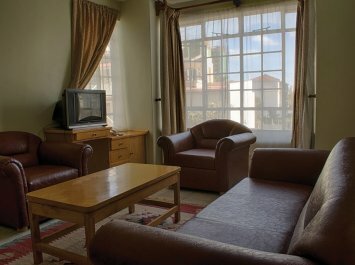 Our one-bedroom apartments also have a balcony area to offer some down-time. Imagine watching the sunset after a long busy day with a cool drink in hand or having a fun time as a couple during the evening overlooking the Nairobi skyline, having breakfast outside as you listen to birds and a wave of cool air streams across. Some balconies offer a view of the swimming pool area where residents are welcome to enjoy a swim, bask in the sun as they relax on the poolside chairs.